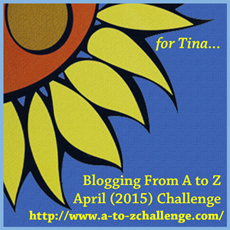 I’ve signed up for the A to Z in April Challenge! It will be my second year taking part and I’m really looking forward to it. The A to Z in April Challenge is when you post every day in April bar Sundays and since there is 26 days in April (when you minus the Sundays) and there’s 26 letters in the alphabet, each day corresponds with a letter of the alphabet. There’s still time to sign up for the challenge here. Last year I had a lot more free time (I was at University and only have six hours of classes a week) but there was no clear theme – though a lot of my posts were about films or books. This year I’m going to have a theme! The theme brings together two things that are very important to me – films and feminism. So this year, each day/letter will be dedicated to a woman in film who’s either first name or surname begins with that letter. The women may be actresses, directors, musicians who have worked in film or something else I haven’t thought of yet – though most of them will probably be actresses. These will be my favourite women in film and while there will be some women whose name begins with the same letter that I love that I’ll have to leave out – I will give out honourable mentions and don’t think I hate one woman because I chose another one instead. Also, I know no one’s perfect and I’m sure if you go back far enough in these women’s history they may have said or done something that’s questionable or possibly offensive – they are human so I’m not going to put them on a pedestal. I’ve already started planning my posts (I hope to have at least ten written before the 1st April) and it’s already really hard to figure out who I’m going to write about. I hope to feature a diverse group of women of different ages and different backgrounds so if that sounds like something you’d enjoy please come back to check out my blog during the month of April. It’s going to be a crazy month but I’m looking forward to it. 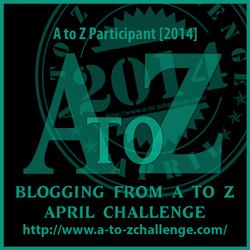 I’ve decided to take part in the Blogging from A-Z in April challenge. So from Tuesday expect a lot more blogs from me, in fact I shall be blogging everyday of April bar Sundays. Since there are 26 days in April (not including Sundays), that matches the 26 letters of the alphabet. So, on April 1st, blog about something that begins with the letter “A” April 2nd is “B,” April 3rd is “C,” and so on and so forth. I don’t really have an exact theme for this challenge but the majority of the blogs will be about films, books, favourite actors/actresses, reviews, and fictional characters. I’ve already written a few of my blogs so I’m ahead of the game there, and have an idea for most of them. To be exact I have written 10 blogs but unfortunately they aren’t necessarily the first 10 days, they’re from all over the alphabet. This should be fun! I did enjoy blogging every day in January but didn’t really expect to do something crazy like sign up to a blogging challenge so quickly. At least after January I know I can blog every day, this time it’s just got the added difficulty level of having to be in relation to a subject starting with a certain letter. There’s still time to sign up if you’re interested in the Blogging from A-Z in April challenge – I do believe sign-ups are open till the first of April. I’ve succeeded in one of my New Year’s resolutions! I have now blogged every single day of January – 31 days of posts from me about whatever interested me that day. I’ve covered films, awards, things that happened to me that day, reviews, theatre, my many DVD’s, TV, and music. During these past 31 days I’ve learnt a lot about myself and also blogging so here’s the main things that I’ve discovered. I do have the time to take half an hour or so out my day to write about something that interests me. 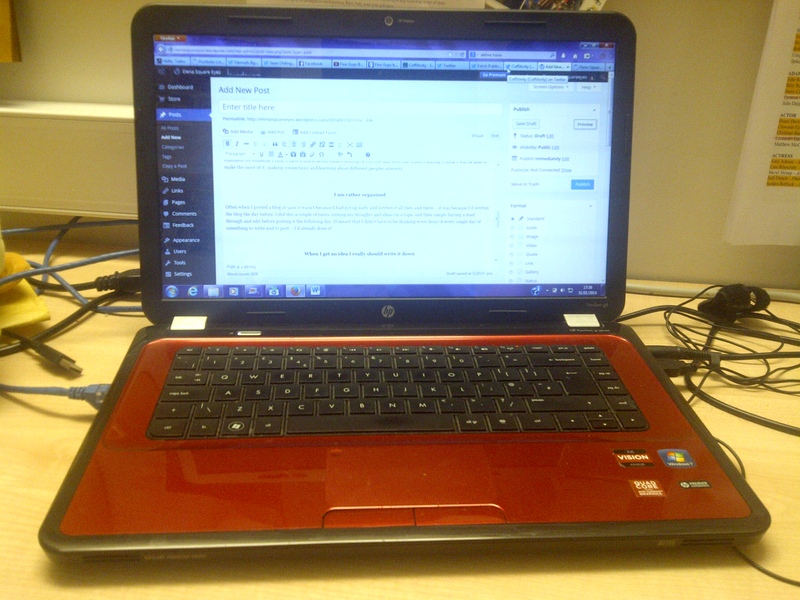 At the start of the month I was posting my blogs at about 11:53pm and only just managing to get in there before the day was over but I soon learnt how to manage my time. After the first few days I easily figured out when was the best time for me to blog – sometimes it was early in the morning, others it was the afternoon. It was all down to managing what I’d got on that day, for instance I’d post a blog in the morning if I knew I was going to be out most of the day/evening and was unsure if or when I’d have the time later on that day to get that blog post up. I’ve always been pretty good at managing my time but this has month has definitely helped me perfect that skill. For my Masters I’ve got to do a 12,000 to 15,000 word dissertation on any subject on my choosing relating to Media and Public Relations. The plan for this piece of work is due a week on Friday and for the last few weeks I’ve been trying to figure out what I’d like my dissertation to be on. I had an idea that could be applied to both comic books and Young Adult novels so it was just a case of figuring out which one I wanted to do more. The basic jist of both ideas was looking at how the marketing materials and techniques differ for comic book/YA books film adaptations when targeting the fans of the source material and the general cinema going audience. So it’s the same area just different focus points. For some reason (I’m honestly not sure what brought this on) I’ve been thinking about how the Bechdel test relates to my everyday life. The Bechdel test is a simple way to determine how well women are represented in media, whether that’s in books, films or TV shows. The three rules of the Bechdel test are that 1) there are at least two named women that 2) talk to each other 3) about something other than a man. Now many forms of media fail the Bechdel test but when you think about your everyday conversations – how can media fail such a simple test?! 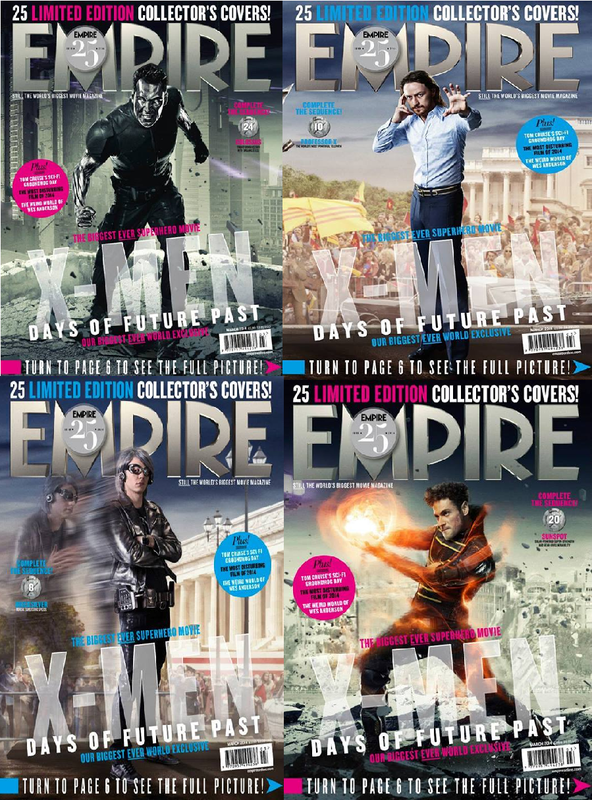 Over the last twenty five hours Empire Magazine have revealed twenty five covers of their magazine staring twenty five different characters from X-Men: Days of Future Past. This is kinda exciting – it the first chance really to take a look at some of the new characters that weren’t featured in the teaser trailer and to have a closer look at those who were. So what did I think? Generally all characters who we’ve already seen either in the original X-Men trilogy or X-Men: First Class look pretty good and what you’d expect from them being in the 70’s or in an apocalyptic future. I did get a bit confused as to why Young!Charles is standing up since he lost the ability to walk at the end of X-Men: First Class and also where does younger!Wolverine with his bone claws fit in the timeline with X-Men: First Class, X-Men Origins: Wolverine and X-Men. Seriously I love these films and the characters (the various X-Men TV shows was my gateway to everything superpowered and I love the movies a ridiculous amount) but trying to figure out their timeline is enough to give you a head ache. Do you ever read a book that you don’t really love but you don’t really hate either, and your just reading it and for the most part it’s enjoyable enough but nothing to shout about till a certain line appears? Yeah, that’s happening to me right now. 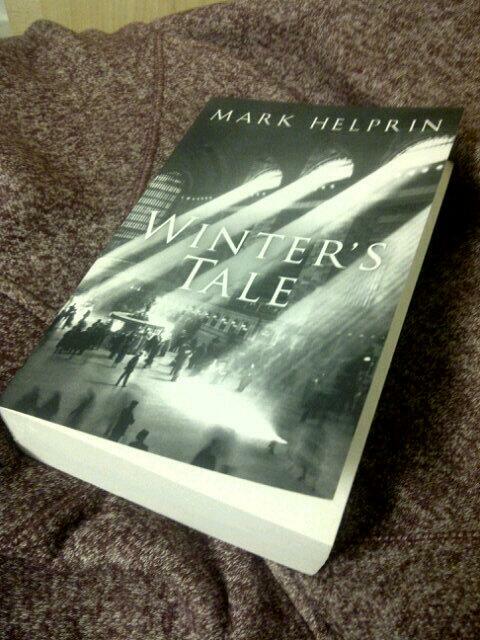 I’m currently reading Winter’s Tale by Mark Helprin and it’s one of those books that’s incredibly long but just when I feel like it’s not for me or I feel a little bored something pulls me right back in.